My my my.... What do we have here?! 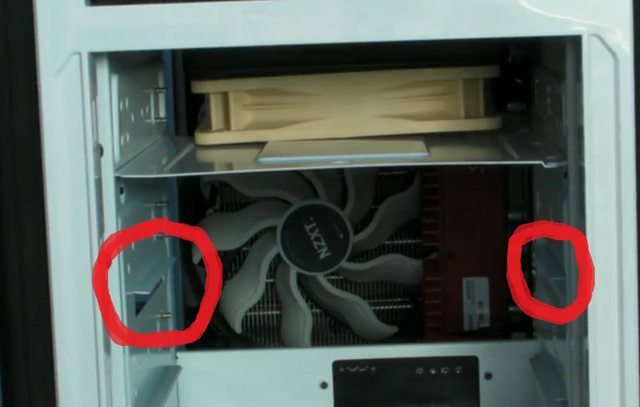 Could this possibly be an NZXT case we have before our eyes? Surely not! It seems my dear readers that NZXT have seen you make many requests for us to cover this case and taken notice. NZXT HQ contacted us directly and apologised for the way the marketing company they use has treated OC3D since our controversial H2 vs R3 review went live last year. OC3D was one of the very few sites in the world that couldn't be bought and was actually brave enough to tell the truth, and because of it we lost a great deal of money when said marketing guy pulled their advertising campaigns. It seems now that NZXT have been made aware of the situation they are not very pleased about the way said marketing person has been dealing with us, so to cut the story short we now now bypass him and talk to the CEO of NZXT instead. NZXT have been nothing but apologetic about what has happened previously and we are now working together to move past this and get back to what we both do best. They make the products, we review them honestly.... Good or bad. Kudos indeed to NZXT for having the confidence in both their product and our impartiality to take this route. So moving swiftly on to the topic in hand, the Switch 810.... The spec list reads like an absolute dream but only time (61minutes if you watch all of the video review) will tell if this case can really cut the mustard. I said previously that the spec list reads like a dream chassis. Well in all honesty the actual end product isn't far short of it either. There are a few minor gripes as you have all come to expect with one of our reviews but don't be fooled, this is just us nitpicking because if NZXT were to go away and make some changes this case might even be deemed as being perfect. So the main items will only be an issue if you are using a 60mm thick 360mm long radiator in the roof with push pull fans. When running this config the top of the optical bay will cover about 30% of the first fan, there is also only about 2mm of room between them as well. The sides of the optical bays above it can be unscrewed but this will make no different to the radiator or the fan being able to get sufficient air flow. If you put a radiator in the roof we would suggest you use the largest thickness radiator possible and then just have the fans in the roof underneath the sliding vents running in exhaust. Another small issue here is the only way to pass the fan cables down into the main part of the case are right at the front which is only really any good if you are running a front optical bay fan controller. If you wanted to pass the cables down in to the main part of the case to go behind the mobo tray for example you would have to put the fan cables down BEFORE fitting the radiator. Now onto the floor, there is mounts in the floor for both a 2x120mm and a 2x140mm radiators/fans (280mm rad will be dependant on the size of you radiator end tank on the front fan mount and may need some minor adjustment to get it in). If you decide to remove your hard drive cages and fit a rad in the floor then you can easily get a 60mm thick radiator fitted in push pull without any issues what so ever. We would advise a maximum PSU length of 190mm for a 2x120mm and just 160mm standard ATX spec legth for a 2x240mm rad. This isn't so much of a problem because the Corsair AX series PSU's are 160mm and they go right up to 850w. Technically the front of the case does not fully support radiators but if you want any more information on the possibilities here then its covered in quite some detail in the video review. So that's the main highlights of the watercooling support which for many is the main reason for having such an interest in the Switch 810, but what about the rest of the case I hear you ask? Well it does appear to have been very well thought out, every major intake is dust filtered are very easy to remove and clean as well. Talking of dust you can actually close the roof vents should you not be running roof exhausts or are going to be leaving your PC off for a while to help stop dust getting in here too! The case is actually quite devious because its not until you fit some pretty monstrous hardware like we have you dont realise how big it is. That's a Gigabyte G1 Assassin XL-ATX board in there, a full sized rad, Havik 140mm heatsink and there's still loads of room! Yet the case doesn't actually look or feel 'that' big. Unlike some other cases of this size that can feel like a bit of an obelisk or like you are sitting beside some kind of engineering experiment the Switch just doesn't feel that imposing. There are 2 rather minor features about this case that even though they are small are just so goddam awesome we can't honestly believe they have not been done before. 2: The fact the fans on the inside of the HDD docks can be angled up to direct airflow at your GPU's or the rest of the system rather than force feeding your GPU with air it doesn't need anyway! These two small things are just plain epic and I'd be expecting other brands to try and rip these ideas of rapidly. I kind of hope NZXT will add these features to any new cases that they bring out over the coming months. I've already got images of a Switch 410 MATX case with dual 240mm radiator support... *splat* ok now I need some tissues. So without writing an essay we couldn't cover it all, that's why we made you an hour long video review. We are pretty confident this will answer all of your questions and also some you haven't thought of yet as well! I'm truly glad we finally got our hands on one of these because it is so damn close to being perfect its unreal. Without a doubt this is the best NZXT case to date, I also think that this is going to create just as big an impact to the chassis market as the Phantom did when that was first released. Welcome back NZXT we have missed you, how could we possibly give the Switch anything other than the OC3D Gold award. But if you fix the issues we have brought up we may just have to go and design a new "Diamond Standard". Thanks to NZXT for the 810 on test here today, you can discuss your thoughts in the OC3D forums. Not a single regret from buying my Switch, it truly is an epic case. First time I saw it I was like Tom thinking in my head you could fit this there, that there or turn this around and do that. I spent ages looking for the right case and there are so many that come close, but none of them allow you to do exactly what you want to do without having to mod something and if you do mod the case it then takes something else away from it and prevents you from doing other things. The Switch is the only case where you can do literally almost everything in it and not have to worry about modding and losing other features for doing what you want in it. One thing Tom didn't pick up on, or maybe he has and is mentioning it in the next vid, but anyway, I will say just in case. If you plan on using a dual drive bay res there are two metal runners that separate the bays into single slots, and if like me yesterday, you didn't notice until you came to fit the res you are not going to be able to do it. What you need to do is either cut them off or bend them down so you can fit your res. only if your rez doesnt have those slots mate. I have my dual bay rez Monsoon and it has slots for the rails to work. Luckily lol but I can see where some may not be slotted and those will have to be removed. Fun part is going to be getting in there and cutting or bending them out of the way. I'll be tearing mine down again in the near future to make some changes. But Epic Review for an Epic case Tom I love it. Mine didn't have the slots unfortunately. It's this one in case anyone else is thinking of using it in the switch.